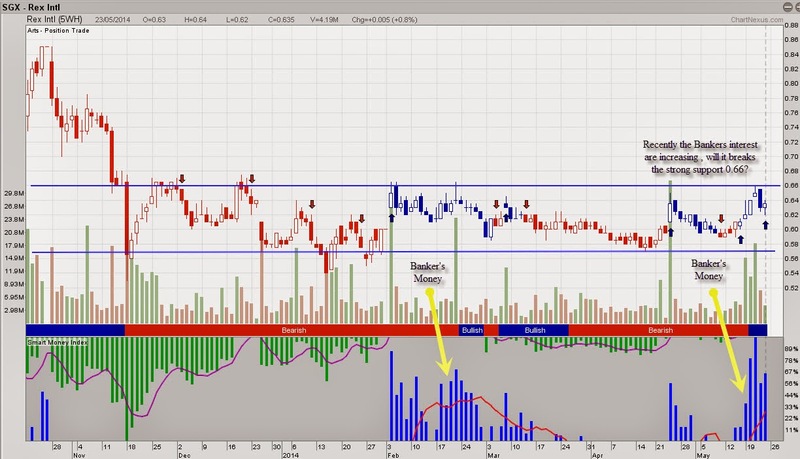 Rex International has been trading in side way for quite some time, however recently are there some signs that bankers are accumulating this stock? If there isn't any accumulating activities, the stock price would have dropped below support level 0.57. The question is will it breaks above it strong resistant 0.66? Let see how it perform ! The Company, through its subsidiaries (collectively, the “Group”), is principally engaged in business of oil and gas production. The Group has concessions which are located in the Middle East, Norway and the United States of America. The Group co-operates with several partners in the development, management and operation of its concessions and licences. In respect of its oil and gas exploration activities, the Group applies Rex Technologies, a set of proprietary and innovative exploration technologies, which provide the ability to accurately visualise and predict the location of liquid hydrocarbons in the sub-terrain.